The performer shows a yellow lace in his left hand, he slowly pulls it through his fist and the lace changes color becoming green. He displays the green lace, but in doing so, he suspiciously keeps his left hand closed… at this stage everybody will think that the yellow lace is hidden in the performers left hand, but to everybody’s surprise the magician shows that in this hand he actually has another lace, but that it is RED, while the yellow one is later taken out of his jacket pocket. - The shoelaces misures 120 cm. 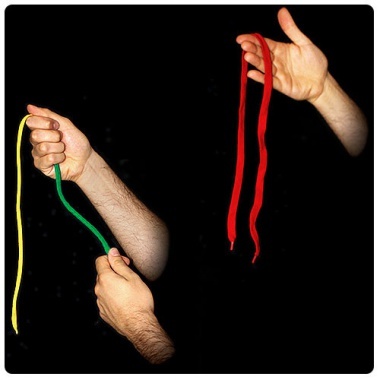 - The video shows the trick with a blue shoelace, but you receive the green one.